Now, I'm not going to lie, I'm pretty "old" now and since most people I grew up with are married and have kids now. I can't help but to wonder if I have a child, will I allow my kid to watch these old shows that I watched as a kid. Short answer is yes but it's a blog and you come here to read. I can still remember being in a overpack movie theater and being this tiny little girl while holding onto my father for dear life as we walked into this large room. It was already so dark and an muppet was playing before the movie started. I remember, feeling so small while looking at the big screen in awe. Sitting down, re-watching this movie for I can not tell you how many times I've seen this movie but I know every line by heart. I smiled again seeing how much Ariel made such an impact on me, growing up. I mean simple things like enjoying to swim and looking for new treasure when I shop and taking a chance with love. The animation still is just wonderful to look at and the characters are fun as well to watch even as an adult. 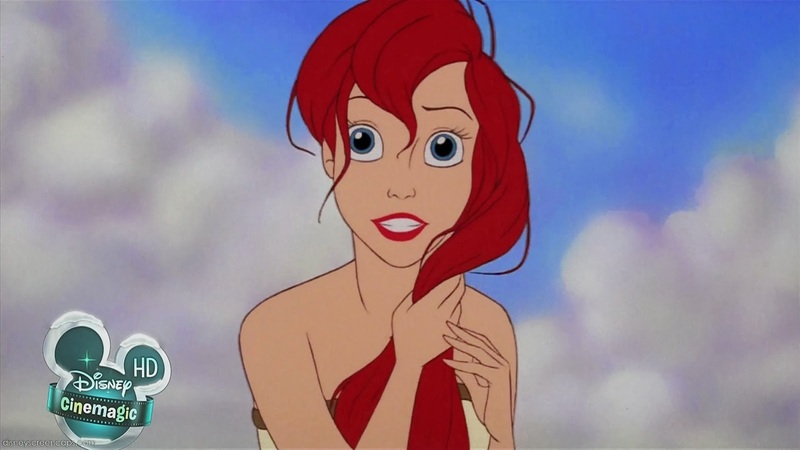 Man, do I love the face expressions of Ariel! Now, there's some reviews that have a real...distaste for this movie. Most of it is because of Ariel and her whining and being selfish. Blah blah blah... Now, I can understand that she does act selfish but I can understand why the character does act selfish and not because she's a princess. For one, she doesn't have much say in the matter. Her father doesn't seem to want to hear her side nor her feelings to why she enjoys and has such wonder for a world so outside of hers. She tries to fight back but ends up giving up with tears ready to come out before she swims away. has so much wonder and dreams and she can't come to her father about it( I doubt her sisters as well) because she doesn't believe he will understand. As the story goes on, yes it shows that he doesn't understand nor allows Ariel to talk things out. Nope it's yelling and breaking her treasures in front of her face, hoping that will show her to not think differently. And..what happens? She's given this chance to taste her dream of being part of the human world and met the man that she can't stop thinking about. Why wouldn't she at this point of the story? Her father broke her dreams in front of her, making her feel alone in the world while the father whom ideal is the one that should be trying to understand her and want her to be happy; not just to be safe from the unknown of the world around them. Oh and one of the best lines I have ever heard from a disney movie is this. Huh, maybe this movie is more for the parents then the kids...Ah let's go on. Yes, she whines. Who doesn't? Everyone whines, it's what we humans do when we are unhappy or just simply enjoy to whine about things because hell that's why we have blogs. 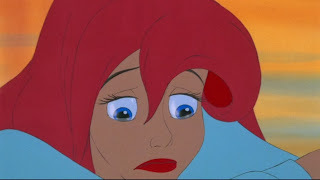 Ariel mostly whines because again she isn't given an chance to have that dream of hers to come true nor have any family members to talk to about it. Ariel wants more and I don't really see this as a bad thing but as a good thing to have. What's wrong with wanting more out of life? Like having a house or having a better job whatever it is. 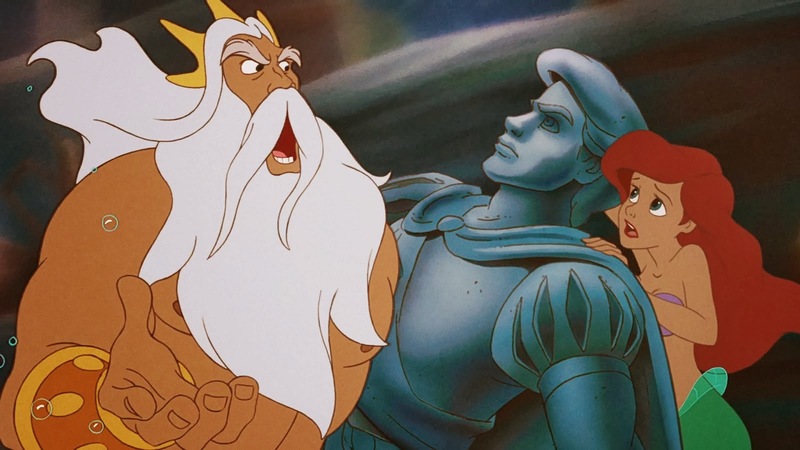 Things didn't go as plan during the story for Ariel. I still want to cry when Ariel watches the boat leave without her, knowing that the man she fallen for is marrying someone else. She took the chance of being hurt and gotten hurt. Sometimes if not all the time, you'll get some disappointments and heartache and I think it's good to show a child this. Let them see that life isn't all dore the explorer. And who doesn't love Ariel given that I'm mad face and jumping in the water to save her man again. 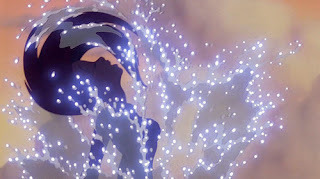 Another thing, I like is that you see Ariel saving her prince but he also help her as well. They are there for each other and that's another great thing to show kids. That love goes both ways. 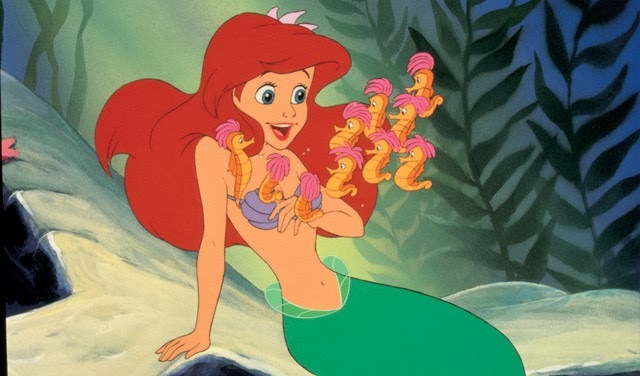 Anyways, The little mermaid will be shown to my kids (if I ever have one). It's a movie, I'll never forget and will always love. I wonder if my kids will feel the same.